USA Manufacturer of floor standing and wall mounted commercial disinfectant wipes dispensers and stands, Glaro Incorporated, announces how it is promoting public health and well being in healthcare facilities across the United States with an innovative line of products. Glaro's wipes dispensers are ideal for commercial use. They present a contemporary design backed by a heavy gauge all-metal construction. Like all Glaro Inc. products, they are built to perform and look great to the public at the same time. According to Glaro Inc., placing disinfectant wipes dispensers and stands in key locations throughout a healthcare facility can be the difference between eliminating germs and creating an environment where cross-contamination can occur. Executives say that FDA approved antibacterial wipes, specifically formulated to kill germs and sanitize nonporous surfaces, are essential to creating a safe healthcare facility. “For example, anytime a person enters a medical treatment room, contamination is a high risk factor. Preventing the spread of germs is imperative to sustaining public health,” says Executive Vice President Robert Betensky. Glaro Inc. is committed to helping medical and other healthcare facilities create an environment with ‘instant access’ to disinfectant wipes. First, Glaro Inc. commercial wipes dispensers were designed specifically to meet the unique needs of healthcare facilities and to surpass existing dispensers in the market. After conducting market research and consulting with doctors and healthcare professionals, Glaro Inc. engineered the all-metal wipes dispensers line with surface wipes (rolls of 800 each) that are a full 8” by 6” in size. These dimensions are ideal for commercial use on large or small surfaces. 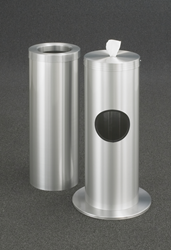 Floor standing dispensers feature 14” diameter weighted bases for added stability. They also have a one-wipe-per-pull design that prevents waste. A double snap button top holds the cover on tight when users pull to remove a wipe. Both floor standing wipes dispensers and wall mounted models are available. In addition, all units are available with or without silk screen signage that encourages use of the wipes. “From top to bottom, our products are tough on germs, ergonomic for its user, and ready to perform with every pull,” added Bob Glass, Plant Manager. Second, Glaro Inc.’s wipes meet strict FDA standards. Disinfectant wipes are FDA approved and they are formulated to keep surfaces, equipment and objects that come in contact with germs clean and harm-free. For example, the wipes are designed to kill Staph, MRSA and HIV-1(associated with AIDS), HBV (Hepatitis B Virus), and HCV (Hepatitis C Virus). They also inhibit the growth of mold and mildew and therefore reduce the odors caused by them. “Glaro Inc. suggests that all gyms also use FDA approved wipes as their gym wipes to create a safer, high traffic health club,” added Mr. Betensky. Hospitals, doctor’s offices, rehab centers, physical therapy centers, veterinary offices, dentists and even urgent care treatment centers are increasingly using FDA approved disinfecting wipes in order to ensure that patients, employees, and visitors are kept safe from harmful germs and unsanitary surfaces that can significantly increase the risk of disease. If you are a dealer or distributor, you can learn more about Glaro's wipes dispensers, wipes and receptacles on Glaro’s website at http://glaro.com/disinfectant-wipes-dispensers.htm or call (888) 234-1050. Disindectant wipes products are available for immediate shipment. Glaro Inc. (glaro.com) is the leading USA manufacturer of commercial and consumer aluminum and steel products sold directly to distributors/dealers for almost 70 years. All products ship in 1 to 3 days. Product lines include bellman and luggage carts, platform trucks, metal trash receptacles, recycling receptacles, smokers’ posts and receptacles, crowd control posts and systems, safety barriers, signs, sign frames, directories, menu display stands, coat hanging equipment, coat trees, indoor umbrella holders, wet umbrella bag stands, metal planters, and key drop boxes.